Debate Fact Check: Republican Guard? I noticed that both John McCain and Barack Obama both misspoke about the special para-military group within Iran. McCain called it the Republican Guard, a usage that Obama repeated when it was his turn to talk. The Republican Guard was Saddam Hussein’s special military unit. The Revolutionary Guard is what Iran’s special unit is called in English. Shelley Berkley is the congresswoman for Las Vegas. Her delegation mate is Senate Majority Leader Reid. She has just returned from Iraq, and her perspective could be problematic for some Democrats. A former critic of the war in Iraq, her comments in the Las Vegas Review-Journal are upbeat and optimistic. “This is a difference from what I anticipated,” Berkley told her hometown newspaper. “I did not anticipate the progress and the extraordinary morale of our troops. Berkley’s also praised the much-maligned Iraqi police. “For years we had heard they weren’t ready to take over, but at this point there is such a significant difference,” Berkley said. “The Iraqis are truly stepping up to the plate and that accounts for the lowering of violence. Still, it is an emotional time. Tomorrow is Memorial Day. I spent the morning at the city’s observances at Mt. Hope Cemetery and just finished watching the National Memorial Day concert. My father participated in Memorial Day observances with Chapter 51 of the Special Forces Association at the Nevada Veterans Memorial Cemetery in Boulder City, Nevada. Bacevich, who is a skilled writer and knowledgable thinker, is acting in accordance with the pain of a father grieving over a son. I’ve known Lt. Bacevich’s father, Boston University professor Andrew Bacevich, since 1998 when he helped author a study with Eliot Cohen about the possibility that Israel would eliminate universal service — one of the foundations of its civil society. While he once worked with Cohen, now an aide to Condoleezza Rice at the Department of State, Professor Bacevich is an independent thinker and an opponent of the Iraq War. But, as Jules Crittenden wrote in a moving piece in The Boston Herald, yesterday belonged to the professor’s son. The younger Bacevich graduated with a degree in communications from Boston University and worked for Governor Romney. A patriot, he believed he had to give more to his country. 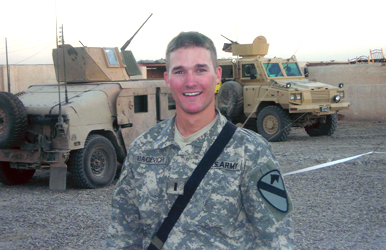 Instead of working on a presidential campaign, Bacevich gave his life in Iraq. Contributions can be sent to the First Lieutenant Andrew John Bacevich Memorial Fund at Boston University, Office of Development, Boston University, 1 Sherborn St., Boston, MA 02215.